Orix the All-Seer is an NPC inside a cave on Antoran Wastes (located under the eastern portion of the bridge spanning the fel pools). Players can only loot Intact Demon Eyes when under effects of the Agent of the All-Seer buff. This buff can be obtained by clicking on All-Seer's Focus located throughout Antoran Wastes, or by using items rewarded for turning in Intact Demon Eyes (All-Seer's Draught and Gift of the All-Seer). Deals 197 Magic damage and reduces the target's speed by 50% and damage done by 50% for 1 round. Rots the target's flesh, dealing 492 Undead damage and transforming them into Undead for 5 rounds. They most certainly buffed the currency drop rate. took about hour and a half just above the spririt crucable. the mobs spawned nearly instantly. Finally was able to obtain the 1000 eyes to buy this guy. The drop rate for demon eyes seems to have been buffed as I was able to get the last 400 within a half an hour farming the wyrmtongues in antoran wastes. took me 3 idol touches to get 1k eyes but thats because i eneded my 2nd buff with 996 eyes. It roughly takes 2 hours to farm. The pet itself is NOT cageable. Yeah but how does it battle? Is it worth farming 1000 eyes for? 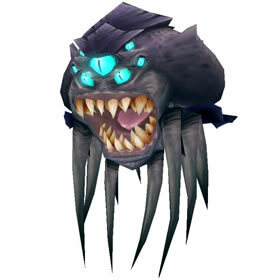 This is one of the few pets with Nether Portal which is both strong and annoying. You can get this one with about 2-4hrs of farming pretty consistently (eg not dependent on high RNG boss drop). One good farming spot is in southern Antoran Wastes near the Felfire Armory, where the world quest to sabotage 6 Legion bombs is. Pick up bombs from the green bomb piles and use to quickly AoE a bunch of demons here. To begin the farm simply locate an All-Seer's Focus in Antoran Wastes (possible locs). Clicking the altar will grant a one hour transformation buff at the cost of 90% of your max health (make sure you're healed up). This will substantially increase the damage you take from all sources (Engineers, beware using Nitro Boost) as well as make you KoS to Army of the Light NPCs near the beacons but allow you to loot the occasional Intact Demon Eye from mobs. Hand in 1000 eyes to Orix the All-Seer.